Giorgos Manolakis was born in Heraklion, Crete in 1982. When he was eight years old he began learning the cretan laouto, taught by his father, Kostas Manolakis, who was one of the major laouto players of his generation. After six years he began studying the bouzouki beside several remarkable teachers. Today Giorgos Manolakis is considered one of the greatest virtuosos of his generation on the laouto and bouzouki. 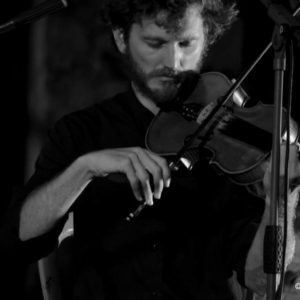 He has worked with many notable musicians and composers: Ross Daly, Hainides, Naseer Shamma, Psarantonis, Sokratis Malamas, Zohar Fresco and others. Giorgos Papaioannou was born in Athens in 1982. He began his musical studies at an early age at the Attiko Conservatory. Since the age of 15 he has participated in several classical orchestras as well as in many other music groups incorporating various styles. 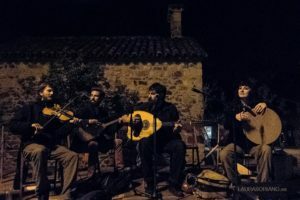 Since 2000 he has been living in Crete where he studied sound engineering and started studying and performing traditional music. He attended Turkish and Arabic violin seminars as well as seminars focusing on Bulgarian music at Labyrinth Musical Workshop. He was also awarded a scholarship to attend a course in South Indian Violin taught by Dr. L. Subramaniam at the Royaumont Institute in France. He has participated in music and dance festivals all over Greece and performed in concerts in Spain, Italy, France, Sweden, Denmark, Turkey and other countries. He has collaborated with various artists all of whom he admires a lot.